This lesson gives some information on Earth's magnetic field: the physics of how it is produced and its geologic history. Many suggestions for further reading are also listed. It might be considered useful background for any activity having to do with magnetic compasses. Lecture slides attached. The earth has a magnetic field, similar to a bar magnet, with one pole in the northern hemisphere and another pole in the southern hemisphere. A compass works by aligning with this magnetic field. By definition, the end of the compass that points towards the arctic is called a "north" pole, and the end that points towards antarctica is called a "south" pole. Amusingly, this means that the earth's pole in the arctic is actually a south magnetic pole — it attracts the north poles of compasses — and the pole in antarctica is a north magnetic pole. Fig. 1: Gilbert's sketch of the alignment of bar magnets at various latitudes on the earth, as reproduced at Wikisource. The earth's rotation axis is horizontal in this diagram. 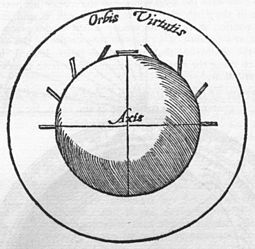 Although magnetic compasses were already being used in 12th century China for navigation, and maybe much earlier by the new world Olmec society, 1 the first detailed description of the earth's magnetic field did not appear until 1600 with the publication of William Gilbert's book: De Magnete,2 in which Gilbert sketched the effect of the earth on magnets at various latitudes (see figure 1). Fig. 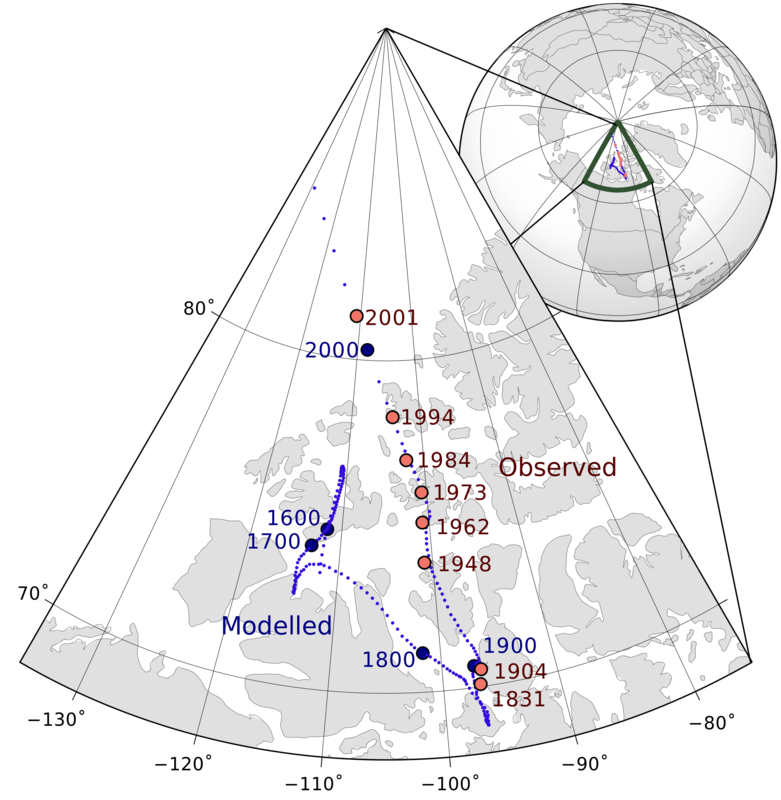 2: History of the north magnetic pole location as provided by Tentotwo at Wikimedia Commons. Fig. 3: History of magnetic field reversals during the last 5 million years, as determined from geologic records. Dark regions indicate times when the magnetic field had the same orientation as today; light areas indicate times when the magnetic field was reversed. Image available from The U.S. Geologic Survey via Wikimedia Commons. Today, earth's magnetic field at the surface of the earth has a strength of about 50 $\mu$Tesla (varying with location, especially latitude), about one thousandth the surface field of a typical refrigerator magnet.4 Earth's field has not always been this strong, nor has it always pointed in the same direction. The chaotic nature of convection currents in the earth's core gives rise to fluctuations in the magnetic field. Over the course of recorded observations, earth's magnetic pole has drifted by several degrees (see figure 2). Over the course of eons, much more dramatic fluctuations are evident from the geological record (figure 3). Apparently, the most stable orientation for the earth's field is more or less along the axis of rotation, which makes some sense given that the convection currents in the earth's core are also influenced by earth's rotation via the Coriolis Force. However, this constraint leads to two possible stable orientations for the magnetic field: one with the north magnetic pole in the arctic, and one with the north magnetic pole in Antarctica. Geological data record that both configurations of the earth's magnetic field have been present throughout earth's long history and that the earth's field has reversed polarity 171 times in the last 71 million years.5 The sun, which has a magnetic field similar to earth's, reverses its magnetic field regularly every 9 to 12 years. David P. Stern at Goddard Space Center has posted an extremely thorough and lucid discussion of magnetism and especially geomagnetism at http://www.phy6.org/earthmag/demagint.htm, with special notes for teachers. Gary A. Glatzmaier at Los Alamos National Laboratory and Edwin S. Robinson at Virginia Polytechnic Institute offer expert insight into geomagnetic reversals at http://www.scientificamerican.com/article.cfm?id=what-causes-the-periodic. You can determine the precise magnetic field strength and direction for your locale using NOAA's geomagnetic field calculator at http://www.ngdc.noaa.gov/geomag-web/?id=igrfwmmFormId#igrfwmm. Truls Lynne Hansen at the University of Tromsø offers a history of geomagnetic navigation at http://www.tgo.uit.no/articl/roadto.html, as translated by Chris Hall. 1. See the article by John B. Carlson at http://www.sciencemag.org/content/189/4205/753.abstract for some conjectures on an Olmec compass. 2. Gilbert's De Magnete can be read here in English translation courtesy of the folks at Project Gutenburg. 3. The model of the self-sustaining magnetic field begs an obvious question: how did it originate in the first place? Some scientists suggest that flowing metal in the earth's core might become electrically charged, perhaps through friction with other layers, thereby initiating an electric current. 4. See http://en.wikipedia.org/wiki/Orders_of_magnitude_%28magnetic_field%29 for a table of magnetic field strengths.